Here’s the story of a grand romantic gesture that CRASHED AND BURNED. There’s a guy named Tyler Schultz in Florida. And back in May, he had an idea of a creative way to propose to his girlfriend Madison. He tweeted Insomniac Games, which is the company that was making a new “Spider-Man” video game. And he asked them if they’d slip the phrase “Madison, will you marry me?” somewhere into the game. And they actually said yes. 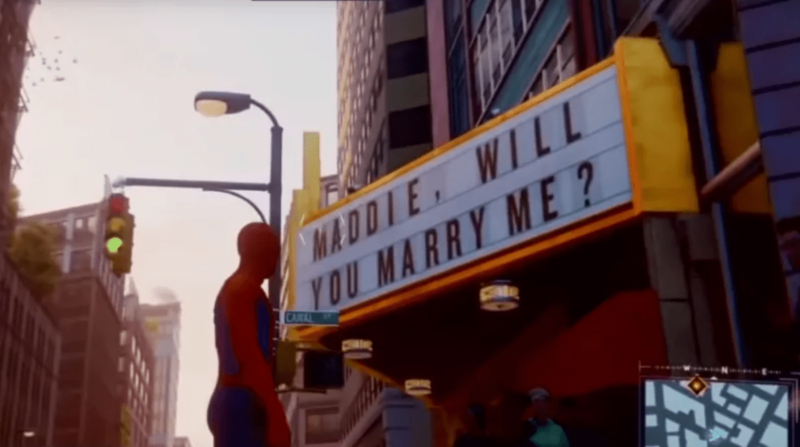 So “Marvel’s Spider-Man” came out last week, and it DID have the proposal in it . . . the developers hid it on a movie marquee that Spider-Man walks past in the game. There’s just one problem. Madison DUMPED Tyler last month. She says their relationship had a lot of issues over the five years they were together, and it finally got to be too much, so she ended things.